It’s about that time! Time for basketball banquets! I love decorating for them. They are such a challenge, trying to figure out what the athletes will like, trying to figure out something new and fun, but not make it look overly fancy or like a little kid’s birthday party. I think we succeeded! I made an inspiration board for last year’s banquet. We decked out the tables with white paper and black runners. 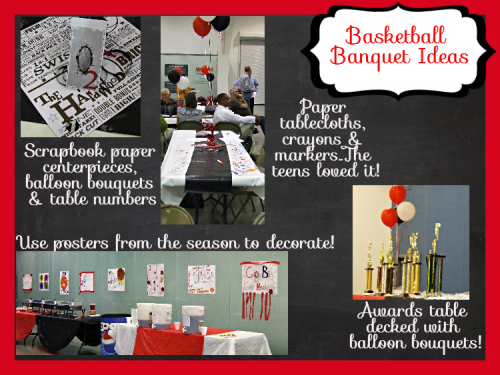 Then used various basketball scrapbook paper for centerpieces. On top of the centerpieces (not really shown in the pics) we scattered various 3D basketball sayings also from the scrapbook section, sayings like “Go Team, Swoosh, etc.” Then we made balloon bouquets and put them in the center of the centerpieces. And of course with a large crowd you have to have table numbers. I made these on my computer, they have a picture of a basketball crashing through glass. Really cool! Then to top of the tables, we added crayons. Yes, I said crayons! The kids, uhm…teenagers, uhm… athletes loved it! So did the parents, be honest, you know when you see white paper and a crayon, you’re going to doodle. I hated throwing away the works of art at the end of the evening. For the awards table and the food tables we kept it simple with alternating black, white and red tablecloths with alternating circle table cloths. We also used the banners the teams and fans made during the season to decorate the walls. Everyone loved that. It gave all the athletes and fans a chance to really see them up close and they had worked so hard on them, why not use them, right? It was very simply decorated, but it was very cool and most importantly our high school athletes, both boys and girls, as well as the younger athletes liked it!